Click here for a printable/shareable pdf version of our 2017 Superintendent of Public Instruction Candidate Questionnaire. The Wisconsin Constitution provides for public control of its highest public education office through election of a state Superintendent of Public Instruction every four years. On Feb. 21, 2017, Wisconsin will hold a primary election for Superintendent of Public Instruction, and the two candidates with the most votes will face off in the April 4 election. What do you believe is the role of the State Superintendent in relation to public education in Wisconsin? In your view, what is the most pressing issue facing public education in Wisconsin, and how would you address it if elected? 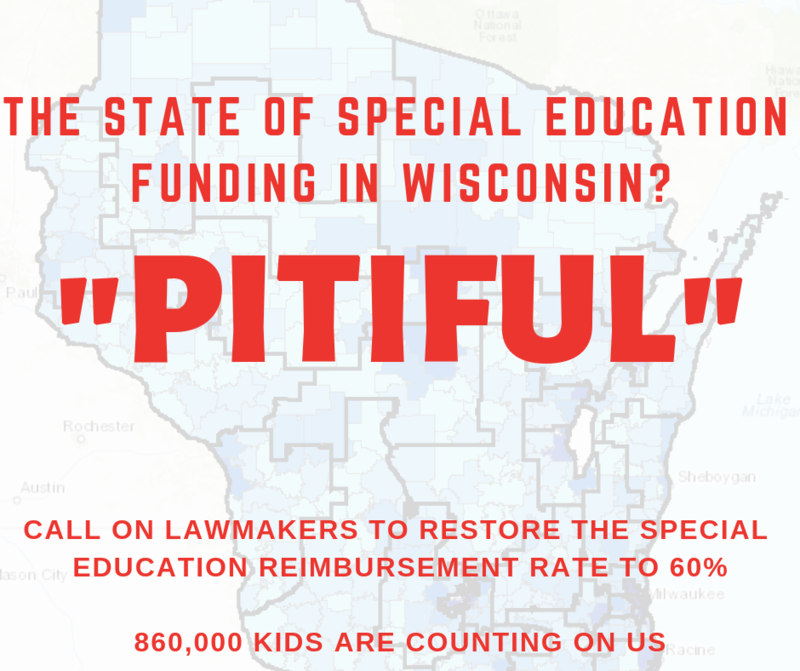 What changes in school funding will you promote in order to direct resources to districts, schools, and students based on their unique needs, such as geographical location (particularly urban and rural communities), poverty, English language learners and students with disabilities or mental health issues? If you would prioritize funding or resources in one or more of these areas, explain why. 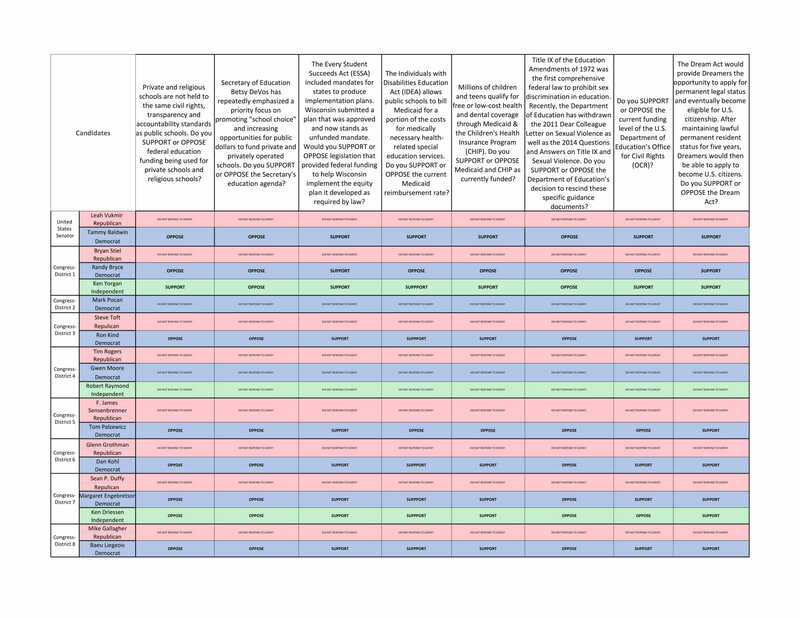 What is your position on publicly-funded private school vouchers (including statewide expansion and special needs vouchers) and privately operated (non-instrumentality) charter schools? How do you propose addressing Wisconsin’s teacher shortage? Identify and explain one principled stand you would be willing to take, if elected, that you suspect might cost you some popularity points. 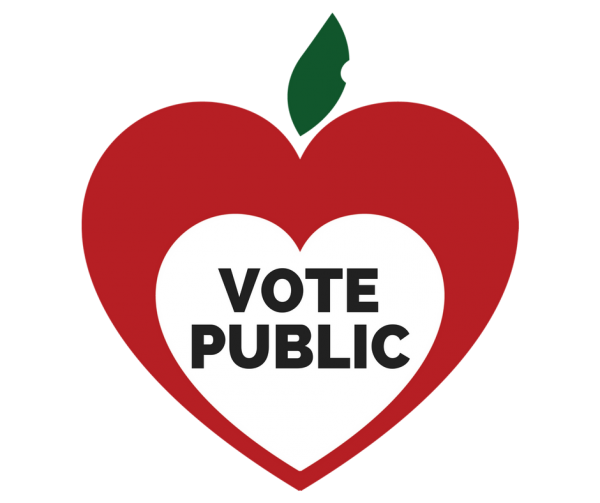 We encourage all who care about the future of our public schools to review the responses and vote on February 21 (primary) and April 4 (spring election). Many school districts around the state also have school referenda and school board elections on the ballot. Voting on these measures is an important part of our responsibility as citizens and in doing our part to preserve and participate in local control. We invite you to stay informed and share this guide and other voter resources with your community. 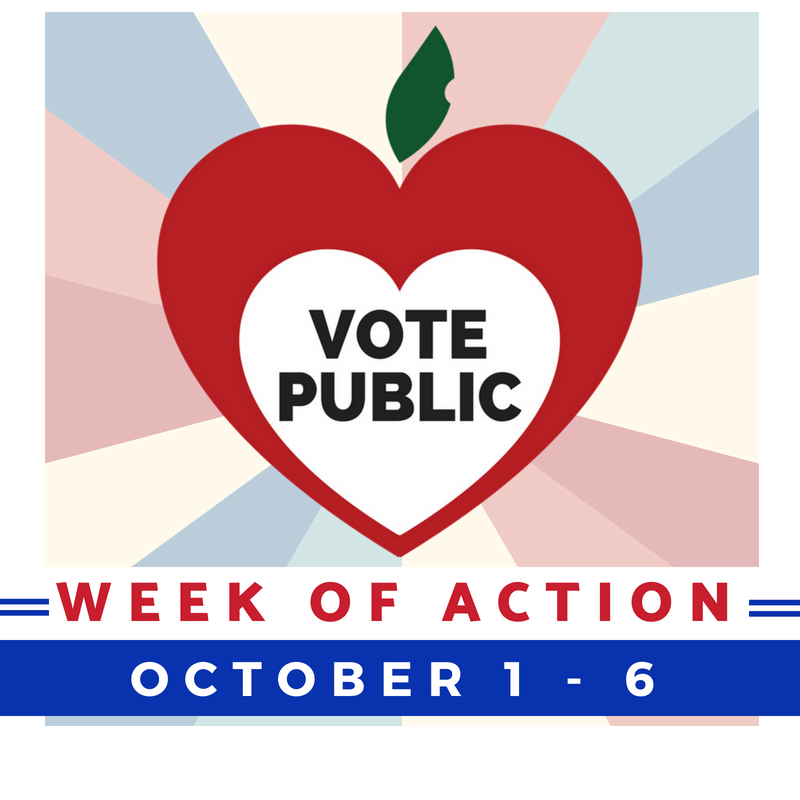 For information on voter registration, voter identification requirements, and to see a sample ballot or find your polling place, visit: http://MyVote.wi.gov. 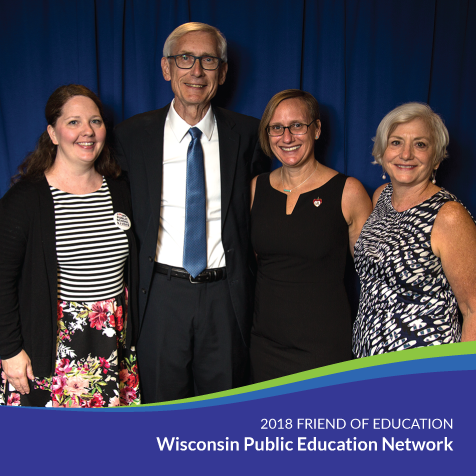 Wisconsin Public Education Network is a coalition of supporters of Wisconsin students and the public schools at the heart of our communities. 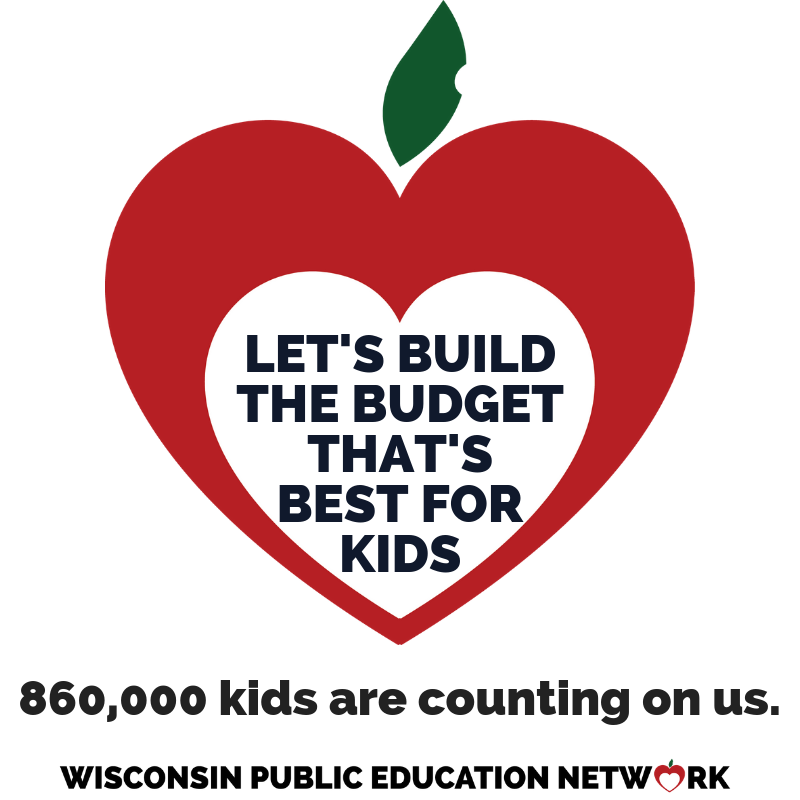 Wisconsin Public Education Network is a project of the Wisconsin Alliance for Excellent Schools, a 501(c)(4) non-profit organization. For more information, visit http://WisconsinNetwork.org. Current position: State Superintendent of Public Instruction Qualifications/Experience: I’ve been an educator all my adult life. I grew up in small town Plymouth, WI. Worked at a canning factory in high school, put myself through college, and married my kindergarten sweetheart, Kathy – also a teacher. I taught and became a principal in Tomah, was the superintendent in Oakfield and Verona, led CESA 6, served as Deputy State Superintendent and have twice been elected State Superintendent. I’ve been an educator all across Wisconsin, and no matter where I worked, I put kids first. Always. Qualifications/Experience: Growing up in suburban Milwaukee as the son of a Democratic mother and Reagan Republican father, I learned that the best solutions were usually found in the middle. A lifelong learner, I have three degrees, recently earning the advanced Ed. S from UW-Madison. I’ve enjoyed a 25-year career spanning juvenile corrections, and leadership positions in three rural districts, plus Middleton-Cross Plains, Beloit, and Milwaukee. Finally, in 7 years with DPI, I saw how a lack of accountability for results stood in the way of progress. I will ensure that every school can improve with visionary new education leadership for Wisconsin. Current position: High School Math Teacher, Park High School, Racine Qualifications/Experience: Twenty-Five years as a classroom teacher in six different school districts in Wisconsin putting into practice the policies, procedures, rules, etc. handed down by lawmakers and bureaucrats. The Wisconsin public school districts I worked in included Seneca, Bayfield, Lodi, Milwaukee, Norris Adolescent Treatment Center, and Racine Unified. Lead Teacher, Wisconsin Academy Staff Development Initiative, a five year NSF funded program researching, planning, and implementing best teaching practices and curriculum into classrooms. I have been elected to the following leadership positions: President; Bayfield Education Association, Executive Board (Bonded Treasurer); Racine Education Association, Board of Directors; Wisconsin Mathematics Council. I am a member of Wisconsin Public Education Network and Wisconsin Rural Schools Alliance. Outside of the classroom I have served on the Board of Elders of Bayfield Presbyterian Church, Board of Directors of Capital Sound Drum and Bugle Corps as well as being one of the co-founders of the Wisconsin Chapter of John Denver’s Windstar Foundation. Finally, I am a citizen, taxpayer, and parent in the state of Wisconsin. Tony Evers: The folks who wrote our state’s constitution in 1848 spent a great deal of time discussing the role of the State Superintendent. The positions taken by our past leaders were varied and strongly-held. But in the end, they agreed that the state superintendent should be independent and elected by state voters just like other constitutional officers. They believed that public education was so important to the well-being of Wisconsin citizens that the position deserved this distinction. Reading about these 1848 discussions humbles me. Along with my colleagues at the department, we do our best every day to live up to the high expectation to provide “general supervision” as articulated in the constitution. When my Cabinet meets with the recently-hired, highly talented employees new to the department, I am further humbled by the passion, energy and talents of those who are called to serve at the Department of Public Instruction. I always talk about our work, whether it is in school nutrition, school finance, educator licensing or any other of our many duties, as being on the “side of the angels”. I believe that I (along with my great staff) am the chief advocate for the 860,000 kids that attend our public schools. It is an honor to serve in this role and to do the hard work that this entails; forging partnerships, finding places of agreement, and generally assisting anyone with a stake in our children’s educational experience to make the greatest positive impact for kids. Lowell Holtz: Did not respond. John Humphries: As State Superintendent, I will have the passion to urgently lead improvements in all schools, and a vision well-informed by successes in Wisconsin districts, other states and countries. For too long, the current administration has avoided accountability, blaming poverty, parents, and funding. Instead, I’ve proposed bold reforms to get our schools back on track, with accountability for DPI and honest information for parents and legislators. The status quo is failing. I will help educators bring our schools back to international competitiveness with new practices, by eliminating innovation-killing red tape, and by unfailingly focusing on school improvement that works for Wisconsin. I believe the most important role the State Superintendent has is to carry out that very first mandate. While understandably more complex in 2017, the vision of our founders was that the Superintendent have a connection with the students, teachers, schools, and communities of Wisconsin and make decisions based on not only on observations but also on input from the people of Wisconsin. Tony Evers: The citizens of the state believe the school funding system is broken. There is not equality of opportunities and there is not equity of distribution of resources. Growing numbers of kids identified by the Supreme Court continue to struggle in our schools, due in large part to the state’s reluctance to support these kids financially. If we believe in equality in outcomes, we must believe in the equitable distribution of resources. My current state budget request restates our Fair Funding proposal. Under my proposal, all students will receive a minimum amount of aid. To provide an extra lift for some students, the general aid formula will weight students living in poverty. Additionally, the per-pupil categorical aid will be weighted to account for foster kids, English learners and students that come from impoverished families. Furthermore, changes to the summer school aid formula will incentivize all schools, but especially those districts that have students who need extra time to achieve at higher levels to engage in fun, summer learning activities. While funding isn’t the silver bullet solution to all, when I travel the state, regardless of whether a district is growing a STEM program, consolidating with a neighboring district, or just trying to attract some excellent educators and paraprofessionals, all paths do tend to lead back to resources, and the state needs to hold up its end of that bargain. John Humphries: Our biggest challenge is the widespread belief that we can’t do better for our students without more spending or before solving poverty. Even when spending was higher, our elementary reading scores dropped from top ten in the nation to 30th. For decades, we have had the worst achievement gaps in the nation. Other states, with more poverty, spend less and get better results! Their state leaders give schools better ways to be efficient and effective. We can learn from these states and the countless examples of great teaching and school leadership across Wisconsin, opening opportunities for all students to succeed. Rich Melcher: Adequate funding of public schools is the most pressing issue. Over the years, the state funding formula has been convoluted from its original intent. Merely tinkering with provisions that turn school funding into a game with winners and losers is not an option. I would propose three steps to provide adequate funding for each unique child in Wisconsin. First, the elimination of the “school choice” program either by legislation or constitutional amendment. Second, I would propose a constitutional amendment eliminating Article X, Section 4. This will remove school funding from property taxes and place the responsibility of adequately funding Wisconsin’s school districts on the school fund alone. Finally, I would form a non-partisan commission that would work with school districts to consistently and adequately fund school districts using the wording of Article X, Section 5 of the Constitution; “… in some just proportion to the number of children and youth resident therein between the ages of four and twenty years.” I would add that the unique needs of each student as well as the unique needs of each district must be met. Tony Evers: My current state budget request restates our Fair Funding proposal. Under my proposal, all students will receive a minimum amount of aid. To provide an extra lift for some students, the per-pupil categorical aid will be weighted to account for foster kids, English learners and students that come from impoverished families. ● Provides funds for rural educator recruitment and retention. ● Culturally-responsive curriculum and professional development that helps educators meet the needs of diverse students. I have also worked tirelessly to develop meaningful recommendations to improve the mental health of our students. 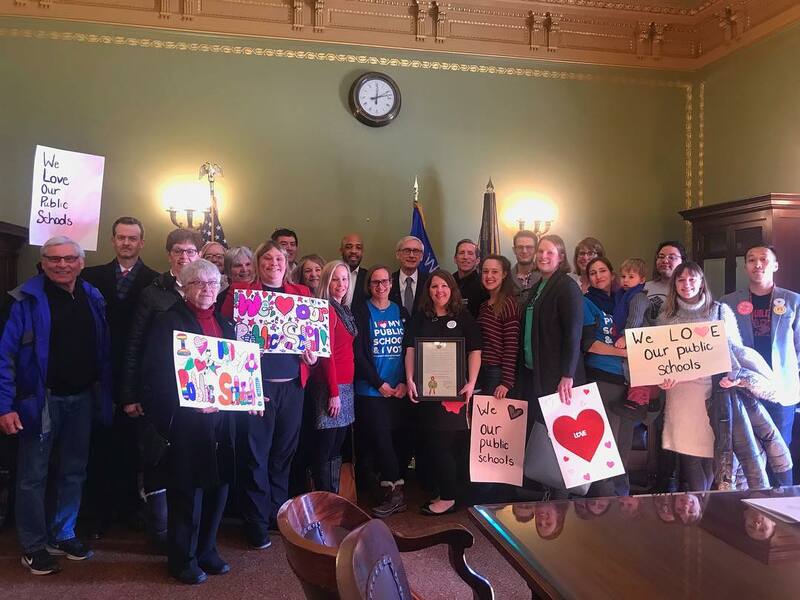 These proposals include additional funding for school social workers, money for community and school mental health grants, and resources to support mental health training for school personnel and community members. Furthermore, we are seeking to provide increased Medicaid funding for youth treatment of mental issues. An estimated one in five children need these services. John Humphries: As a district-level administrator, I would love more funding for schools. Who wouldn’t? I believe support for rural schools and those educating many students from low-income families are significantly underfunded. And yet, I know with the right leadership at DPI, schools can also do better with the $11 billion we already spend. Too much is wasted on ineffective programs and red tape. DPI should eliminate burdensome regulations and help schools use new, effective teaching strategies. I reject those who blindly call for “more” funding and say little else, when we know the “how” is what matters most. Rich Melcher: My changes are spelled out in the previous answer. If forced to prioritize funding or resources, I would provide full funding to early childhood detection, intervention and on-going support for the full range of mental health issues that present themselves in each unique child. I’m sure if I looked I could find a study that shows what my experience of twenty-five years in the classroom has shown me. Focusing on the very beginning stages of a student’s learning has the most impact on success in later years. 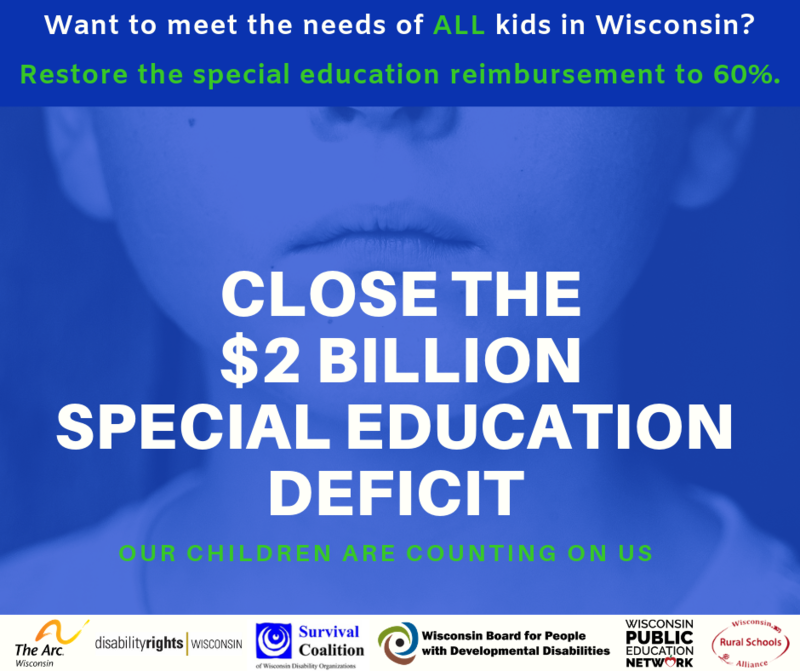 Tony Evers: The majorities in Washington and Madison have spent years expanding taxpayer subsidies to private schools, including special needs programs in these schools. The result: historic cuts to education followed a slow trickle of financial support for public schools amidst the statewide expansion of vouchers. A recent Fiscal Bureau reports indicate that over 200 districts (almost half) would have received more state aid without the changes in voucher funding that shifted cost to local districts. When we move past the ideological battles, we’re left with tough choices about priorities and responsibilities. Bottom line: we have a constitutional obligation to provide an education for every kid in this state, from Winter to West Salem. Accountability should apply equally to all publicly-funded schools, including voucher schools. Regarding independent charters, we must remind our policy makers that 96 percent of publicly-funded students go to a school governed by a local school board. In general, charter schools work best when authorized by a locally-elected school board that understands their community’s needs, and is accountable to them. John Humphries: Thousands of low-income kids have found a bright future because their parents have been able to choose the right educational environment for them. Just like in public schools, voucher funding follows the child wherever the parent chooses to send them. The State Superintendent doesn’t control the number of vouchers or the funding. I will focus less on politics and voucher battles, and more on creating strong learning environments for all children in all schools in all parts of the state. Together, we can make improvements in teacher training, student discipline, universal literacy, and more, that will help every student succeed. Rick Melcher: Make no mistake, this is an entitlement program designed to divert public taxes to privately owned schools or religious schools. Although powerful outside influences have convinced some judges to decide to the contrary, I believe this is unconstitutional and I would work with legislators to change the statutes that allow this. Failing this, I would work with my constituents to find legislators who would be willing to change the statutes. Alternatively, I would work with legislators or work to find legislators willing to create any needed constitutional amendment to eliminate this. Tony Evers: There are several main factors impacting this issue. The first is the negative rhetoric that occurs all too often around the teaching profession. The second is that Wisconsin educators’ pay has taken a significant hit in recent years – an actual decrease of over 2 percent over the past few years (and changes to benefits and retirement have further eroded take home pay). Our current high school students pick up on this, and increasingly they are not look at teaching as a viable career path, and in Wisconsin, our teacher preparation programs are reporting record lows. We need to continue to highlight the excellent work our teachers do each and every day and bring back teacher voice into what goes on in the classroom. I am currently working with a small group of Wisconsin educators on a project we are calling “Every Teacher a Leader,” an effort to highlight and promote excellent teacher voice and leadership. Let’s highlight the leadership and critical decision-making our educators use every day in their roles. The cultures of our schools must be strong and support teachers as they work with our students. I continue to advocate for additional resources in our schools to address the most pressing needs of our students and to provide resources for teacher to do their jobs. John Humphries: I would start by improving teacher preparation so our new teachers are less likely to leave the profession after 3-5 years. In 2007, the National Council on Teacher Quality said Wisconsin’s teacher preparation programs were “languishing.” Tony Evers dismissed this troubling finding, saying that DPI is “a leader in… outcomes-driven licensing and preparation system.” A decade later, NCTQ still gives us very poor marks, and coupled with Wisconsin’s disappointing elementary reading outcomes, we have even more warning signs of major problems in teacher training. Too many well-qualified young people who want to be in the classroom spend four years and tens of thousands of dollars in college only to face a “sink or swim” approach as a new teacher. Our training is inadequate and so is our support system for new teachers. When I am State Superintendent, this will change. Successful models that reduce the amount of time in college classrooms and give more time to classroom-based experience need to be adopted. Rick Melcher: School districts across Wisconsin are already finding ways to attract new teachers. One that I heard of teams the district with local realtors and lending institutions to find housing for new teachers under a modified mortgage plan that provides opportunities to either own or lease to own a home in the community they teach. I would seek out more of these ideas from across the state. Other possibilities include coordinating with the loan forgiveness programs provided by the federal government. These programs require ten years of income based monthly payments to receive loan forgiveness. I propose that the state pay half of that monthly payment for teachers who agree to teach in areas of teacher shortage. Another possibility is to create a five year contract in which a teacher with a professional educators license agrees to accept 80% or 4/5 of his or her allotted salary. The veteran teacher further agrees to receive training to be responsible for a student teacher within the first three years of the contract and to have a student teacher during the fourth year of the contract. The veteran teacher is then given a one year sabbatical during the fifth year of the contract with the guarantee that the veteran teacher will return to his or her previous assignment. During the fifth year the student teacher takes over the class of the veteran teacher. Tony Evers: Promoting excellence for all children continues to be the defining work of my administration. An equitable education for all students is our priority, and it will continue to be as long as achievement gaps among student groups exist. I had the honor of leading the Council of Chief State School Officers’ effort to fully realize their commitment to equity. In early February, my colleagues will be releasing, in conjunction with the Aspen Institute, 10 specific opportunities that we, as state leaders will commit to remove barriers to equitable opportunities for all children. The commitments range from reallocating resources to designing accountability systems that have an equity lens and increasing a focus on culture, climate and social-emotional development. Additionally, I initiated the Promoting Excellence for All program. This program provides information and strategies successfully used by Wisconsin educators to raise achievement of students of color, closing the gap between them and their peers. These educators represent all grade levels, urban, rural, and suburban. The online modules focus on effective instruction, teacher-student relationships, family and community engagement, and school and instructional leadership. The work around promoting excellence is hard, and controversial. To ensure that all kids get the lift they need sometimes necessitates important conversations about race, the impact of poverty and reorienting the use of resources. Providing more for those who have less is not always a popular decision. But, I view promoting excellence for all kids, equity for all, as one of the defining issues of this century. John Humphries: I have chosen to focus on school improvement and to use school choice as a way to expand opportunities. The State Superintendent does not control the number of vouchers, charters, or choice schools, or the funding for these schools. For too long Tony Evers has fought against vouchers and has not provided adequate support for public schools to improve. I’m a fighter for traditional public schools. I’m a fighter for charter and voucher and online schools too. It’s time we ditch the mentality that says schools in one sector win by making schools in another sector lose. In fact, the funding follows the student so each school must attract students based on outcomes. As State Superintendent, my singular focus will be on helping ALL schools improve and I’ll do whatever I can to give all schools the flexibility they need to do what they feel is right for students. Fundamentally, it’s a new landscape for education in Wisconsin and schools need new strategies and new leadership for success. Rick Melcher: Too many special needs students are being mainstreamed into regular education classes, simply because schools want their statistics to look good. These students have special needs and regular education teachers are trained to give instruction to regular education classes. When Special needs student are deemed ready to participate in regular education classes, any modifications needed should such that they do not cause unnecessary strain on any of the students or the teacher. Bottom line, if the special needs are not addressed, the learning environment for all students is disrupted.